University of Southampton academics are pioneering a new way of using motion capture technology to examine the way pianists play the piano. By using a unique kinematic measurement technique, known as HAWK (Hand And Wrist Kinematics), researchers will be able to look at individual pianists' playing technique - giving an insight into the posture of their hands on the keys and the movements they use - hopefully showing how this translates into the unique sound they create. The research will also provide new information on musicians’ hand health, to combat wrist injury (for example, repetitive strain injury - a common problem for pianists). The project is being led by world-renowned pianist and University of Southampton Music Professor David Owen Norris and Health Sciences academic Dr Cheryl Metcalf. 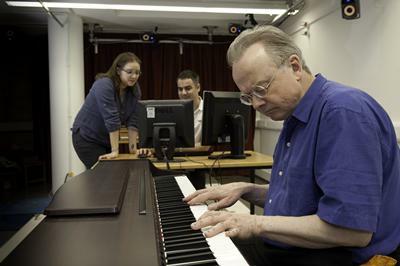 By using a state-of-the-art motion capture laboratory, equipped with recording technology and Vicon cameras - the same sort of technology used in Hollywood films for special effects – Professor Owen Norris will be able to track pianists hand movements using the motion capture cameras. 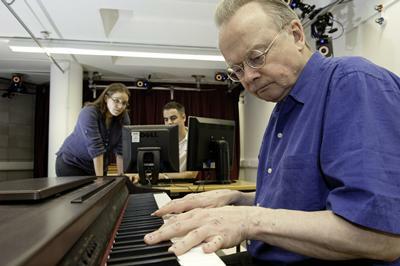 Professor David Owen Norris says: “It’s fascinating to watch pianists’ hands. Audiences always want to see exactly what’s going on with those flashing fingers, and pianists look at hands too; we argue about the best ways to make certain sounds and we compare what different players do with their fingers and their wrists. Professor Owen Norris and Dr Metcalf are trialling this technique for the University's Multidisciplinary Research Week, a programme of activities from 6 to 10 February that showcase different aspects of multidisciplinary work at the University of Southampton. The resulting film and analysis will be presented during this week ‘in concert’ at the Turner Sims, on the University’s Highfield Campus, on Monday 6 February. They hope they can develop the research further to build an archive of pianists playing techniques, from music students to visiting concert pianists, with the hope of establishing how technique affects sound and advise on how to avoid injury.